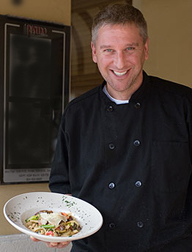 Executive Chef Brian Rutherford of Bistro Mezzaluna in Fort Lauderdale, Florida shares a delicious taste of the restaurant with his recipes for Pan Roasted Yellowtail Snapper with Lump Crab, Capers, and Tomatoes; and Chicken and Italian Sausage with Rigatoni and Balsamic. Executive Chef Brian Rutherford is a native of Philadelphia who has called South Florida home for the past 12 years. 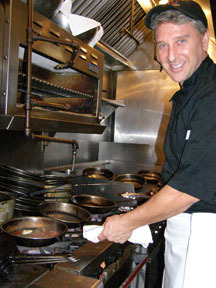 A graduate of the prestigious CIA (Culinary Institute of America) in Hyde Park, New York, he honed his craft first in Philadelphia before moving to Florida where he worked in restaurants in Boca Raton and Miami, and has spent the past 6 ½ years working at Bistro Mezzaluna where his culinary focus is on fresh seafood, pasta, steaks, and chops. I met Chef Brian before having dinner at Bistro Mezzaluna in late March 2009, and when I asked him about some of his recent challenges as a chef, his blue eyes twinkled merrily and he replied, making bread. Although the restaurant had been making all of its own pastry and focaccia, making their own bread was a new chapter in the restaurant's evolution. Making bread requires a deft hand and is truly an art, even more so in South Florida, where the challenge is the humidity that can affect the rising of the dough. When they decided to make their own bread at the restaurant, as expected, there were some initial trial and error moments, however when I later sampled the bread during dinner that was still hot from the oven, it was clear that Chef Brian and his team have mastered the art of bread making. When I asked him about what he feels are the necessary traits for a good chef, he replied, passion and dedication, and it is apparent that he has both, and his goal is to provide a consistent experience for Bistro Mezzaluna's guests who have flocked to the restaurant since it opened in 1993. Although a chef's life is quite hectic with long hours, in his free time he keeps busy with his children, ages 3 and 4 years, golfing, and eating at other restaurants. When I asked if perhaps there was another Rutherford chef on the horizon, he replied that his 4-year son told him that he wants to be a chef just like his Dad. Chef Brian Rutherford graciously shares his recipes for Pan Roasted Yellowtail Snapper with Lump Crab, Capers, and Tomatoes; and Chicken and Italian Sausage with Rigatoni and Balsamic to provide you with a delicious taste of Bistro Mezzaluna. Method: Heat oil in a sauté pan until it just starts to smoke. Season fish with salt and pepper and dredge in flour. Shake off any excess flour. Sauté the fish for 2 minutes on top side, and then flip over and drain off excess oil. Let fish cook for 2 more minutes and then deglaze with white wine. Add capers and let cook for 1-2 minutes. Add lemon juice, parsley, and basil and let cook for 1 minute. Add butter stirring or swirling pan so butter does not break. Add crab and tomatoes, and season with salt and pepper. Presentation: Serve with scallion mashed potatoes and sautéed asparagus. Method: Heat oil in a sauté pan until it just starts to smoke. Add chicken and season with salt and pepper. Brown chicken a little on both sides. Add the sausage, roast peppers, basil, parsley, pepperoncini, and garlic, and sauté for 1-2 minutes. Deglaze the pan with white wine and reduce by half. Add balsamic vinegar and reduce by half. Add roasted chicken stock and reduce by half. Stir in butter, and let simmer for 1-2 minutes. Toss in the pasta and add olive oil, salt, pepper, grated cheese, and parsley. Buon Appetito! Bistro Mezzaluna is open for dinner Monday through Thursday from 6:00 pm until 11:00 pm, Friday and Saturday from 6:00 pm until midnight, and Sunday from 5:30 pm until 10:30 pm. 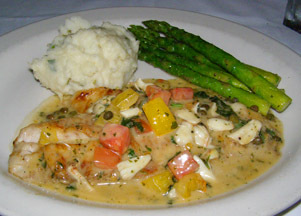 Read about Bistro Mezzaluna in the Restaurants section. For more information on Fort Lauderdale and upcoming events, please visit The Greater Fort Lauderdale Convention & Visitors Bureau website: www.Sunny.org or call 1-800-22-SUNNY. © April 2009. Luxury Experience. www.LuxuryExperience.com. All rights reserved.